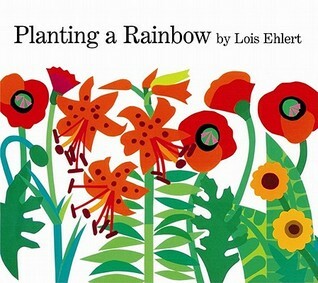 Planting a Rainbow, a classic children’s book by Lois Ehlert, is a book I want to love, a book that I’ve read many times to my son. But a book that I can’t help but alter the words to every time I read. Quite simply the book is about a mother and child planting bulbs, seeds, and seedlings, to grow flowers of every color so they can harvest a rainbow every summer. A great book for learning color but a real lost opportunity in modeling more sustainable gardening practices. So here’s my new version (you can watch the original as a video below). In the fall we plant garlic cloves in the ground. We exchange seeds with neighbors and at our community seed exchange. And wait for the spring to warm the soil and sprout the cloves. Then it’s time to plant some seeds on our windowsill to grow seedlings for our garden. And watch the rainbow grow, and grow, and grow. All summer long we pick the fruits of our garden and bring them home to eat and share with friends. We pick red peppers and red lettuce. Purple eggplant and purple cabbage. And some brown potatoes and brown onions. And when summer is over, we save some seeds, and we can grow our rainbow again next year. Admittedly, with the addition of these new elements, my new version is a bit less smooth and more wordy, but we need food not flowers in our gardens—an idea we can start to normalize in the minds of our children. With the fifth largest crop in America being the lawn, converting those lawns to small farms will mean large new supplies of sustainable food, increased household food security and community resilience, improved local environment, and a reduction in demand for industrial food products. And it all starts with teaching young children to love gardening.